Jordan Hamilton shoots the ball. The sophomore guard scored 18 points in the Cats’ last game against Duke. Before the season began, coach Joe McKeown knew Northwestern would have a tough non-conference schedule to get through. Despite facing two really difficult opponents, Green Bay and No. 21 Duke, last week, the Wildcats responded by passing with flying colors. NU (2-0) beat Green Bay on the road before opening the new Welsh-Ryan arena with a victory against then-No. 21 Duke on Sunday. Now, the Cats are preparing for a mid-week matchup against University of Illinois-Chicago in their second straight home game. Despite playing tough opponents, the Wildcats have continued to play aggressively as a team. One facet of NU’s style of basketball has been its aggressive play on defense. In two games, the Wildcats have held their opponents to a 37.5 shooting percentage and have forced the teams to combine for 45 turnovers. In addition, Pallas Kunaiyi-Akpanah has been a key cog of the Cats’ defense. Despite getting into foul trouble in both games this season, the senior forward has recorded 31 rebounds to go along with two blocks and two steals. 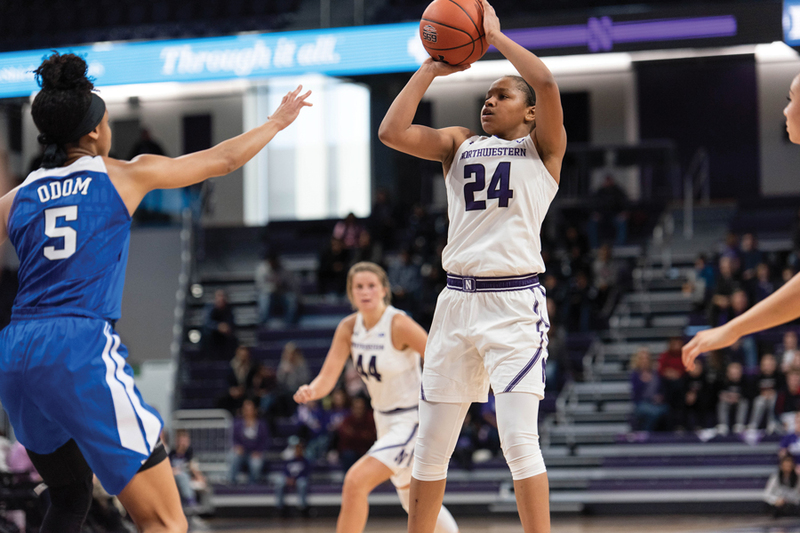 On the other side of the ball, Kunaiyi-Akpanah, who tied the single-season record with 18 double-doubles in a season, picked up right where she left off last season with two double-doubles in the NU’s first two matchups. Aside from Kuniayi-Akpanah, the Cats are a relatively young team with no other seniors. However, NU has shown early on that it can close games, something the Cats failed to do last season. Last year, the Wildcats lost 63-57 against the Phoenix after being down by two to start the fourth quarter. This year, after being down by seven with just over two minutes remaining in the fourth quarter, NU made a huge comeback and beat Green Bay 57-55. Part of the team’s fast growth has been the guard duo of Pulliam and Jordan Hamilton, who have combined to score 57 points and 13 assists in their first two games. The sophomore combo will have to match up against UIC and its guards on Thursday. Seniors Brittany Byrd and Tylah Lampley combined for 49 points, almost two-thirds of the Flames’ points in their first game of the season. In order for the Cats to limit their scoring, they will have to force the guards to take inside shots, as Byrd and Lampley combined to shoot 8-10 from the three-point line. In comparison, NU’s opponents have shot 23 percent from behind the arc. Despite the hot start for the Cats this season, McKeown knows the Cats’ tough schedule will only make them better.